Want to see our non fiction bookshelf? I think i should first take a detailed look at it. Ever since I shifted to the new place, almost all of my free time is being spent on arranging books. There were a lot many cartons filled with books, of all kinds and periods. There were books on general information, too many philosophical books, lifestyle articles, training books, maps, route books and tourist guides, subject-oriented books, novels and competitive exam guides. 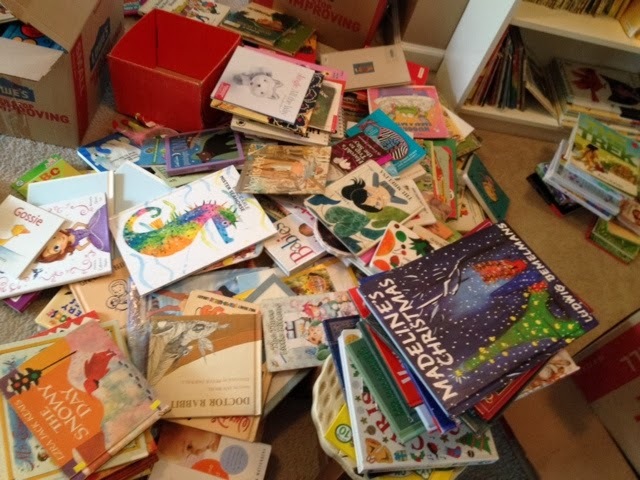 I remember I even had numerous collections of children’s books, but my nephews and guests had taken majority of them. That has helped in reducing my bookish weight during the shifting time. In the early years of my reading, I had a crush on mysteries and scientific fictions, but gradually I lost interest in them. The reason might probably be the repetition of the patterns or my changing taste. I found many new books written in a rather predictive narration. A best-selling non-fiction I happened to see at my friend’s library made me an ardent fan of this genre. Now, whenever I hear about a book festival or sale season in any online store, I forthrightly go into the non-fiction section. I do have some favorite authors already, but prefer not to stick to them, because every now and then, newcomers are making waves in the literature field. My newly found interest has led me to do some random, mindless shopping for books. I get too immersed in completing them on the same day of purchase that I forget to look back on the pile I am creating every day. My husband is quite supportive of my reading habit, but he realizes that it is getting over the board. Now, when we go out for shopping, his heart beats faster whenever we pass by a bookstore. If I am allowed to get in, he knows that I will come out with the longest bill. Now I realize the difficulty. There is no sufficient space to properly organize them in such a way that picking out a single book can be done effortlessly. Things are getting pretty organized on the book front here. I’m also realizing that we have a lot of books and am slowing down on book buying. I feel like I can be a little more focused when perusing shelves at goodwill now. Things are getting pretty organized on the book front here. I’m also realizing that we have a lot of books and am slowing down on book buying. I feel like I can be a little more focused when perusing shelves at goodwill now. So, that’s a good thing, I guess. Read anything good lately? I’d love to hear about it! If you’ve been reading my blog for any length of time, you know that I’ve been a sponsor with Compassion for many years. My husband, Ben, works for Compassion now, but I started sponsoring before he and I even met. I love the work they do and every time I meet a formerly sponsored child, I am further convinced of the great work they are doing with children living in poverty. Compassion’s blog team contacted me and asked if I would be willing to share a formerly sponsored child’s story here on my blog. This is not someone I have met, but the story is very similar to my friends’ stories from Kenya and Uganda who have had relationships with sponsors through the Compassion program. Compassion is not paying me to share this. I’m just sharing because I believe in the work that they do and in the hopes that more children can be sponsored. 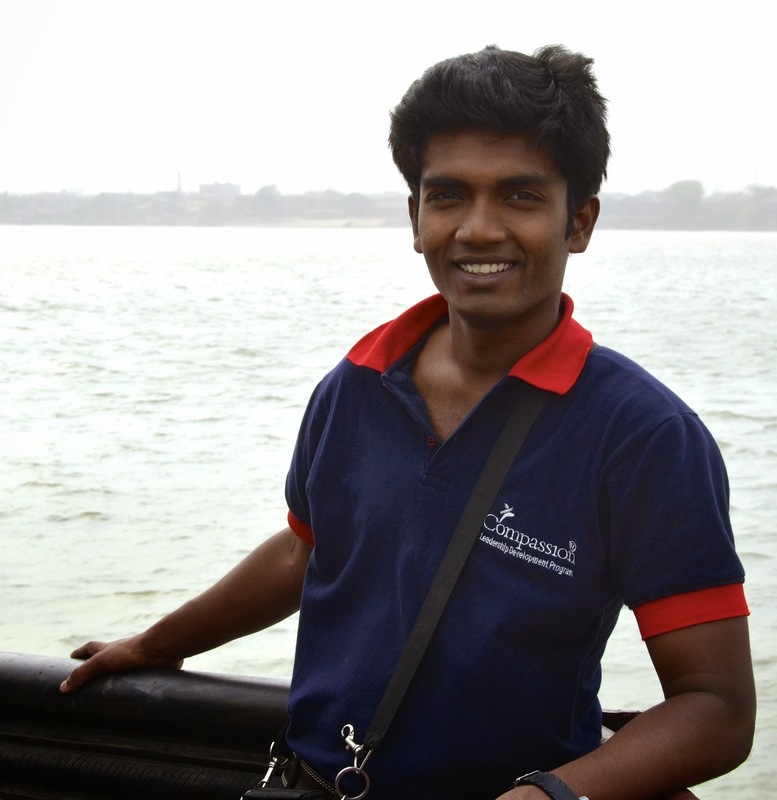 My name is Vicky Roy and I am from Kolkata, India. I had a difficult childhood. My father used to live in a state where there was prostitution, child labour, drug addiction, disease like AIDS, malaria, dengue etc. and colleges, schools and hospitals were very far away. After I was born he decided to move because the area where he grew up was not safe, He migrated to West Bengal, a state where nobody knew him. It was a totally different culture, different people, we had no place to live, no house, no food to eat and he did not have a job to feed us. Survival was very difficult for us and my health was deteriorating day by day because of improper nutrition. The only food I used to get is my mother’s milk that’s all. When I was growing up I would go near by the schools and hide myself and see children of my same age playing with many toys and wearing proper school uniforms. They looked so beautiful and at night I would put myself in their place and I would laugh in my sleep just thinking about playing with those toys, going to school, having many friends. Those were dreams that really made me happy. I was afraid to face the morning because my dreams would end and bring me into reality. My father use to travel 3 hours just to earn Rs 80 a day which is not even $2 in the USA. So when sometimes he would fall sick we did not have Rs 80 that day. I helped my mother in the household work because she had health issues. We got rejected by our people, relatives and communities. We were helpless as well as hopeless and the only option left was to commit suicide but my father could not do that because by that time he already had my 3-year-old sister and 6-month-old brother and I was five. This was my life in poverty. When I was five I got a chance to go to Calcutta Emmanuel School, where I would get breakfast and lunch completely free. Calcutta Emmanuel School is a project of Compassion East India. My father was really happy for me because it was an English school and I would get food there that was distributed in the family. In the project our parents use to go and learn how to raise a child and all the teachings were through the Bible. This impacted my father’s life drastically – he started changing and he would share it with my mother as well and all of a sudden he found hope in Christ and a reason to live and he became a believer with my mother. We had regular scripture classes and but that did not change me because believing in God was next to impossible for me. I have seen death very close. I have seen my father crying. I remember my mother’s face when she used to distribute very little food among five of us. I have seen my brother and sister suffering from improper nutrition and this made my heart like rock, there were no emotions left, there was no place for anyone and I hated people. I was against my father’s decision to believe in Christ and I would question him about the existence of Christ. I got my first sponsor letter when I was 6 years old and I learned that there is someone who supports me, who pays for education, food, medicine, hygiene etc. The letter was very precious to me because it made me wonder why this lady is helping me without knowing me. It was really surprising for me because our own did not support me. She told me in that letter that she loves me and Jesus loves me unconditionally and it is Jesus who told her to help me. From that point on I started responding to her letters and every time she would write I would get excited. I used to wait for her letters. One day she shared the verse Mark 10:14 which says, “When Jesus saw this, He was indignant. He said to them, ‘Let the children come do not hinder them, for the kingdom of God belongs to such as these’” and this helped me understand how much God loves me and how much she loves me. I can proudly say that if she were not there for me I could have ended up as a criminal or an alcoholic. She changed my life, she saved me and helped me to know Christ and it is because of her that I accepted Jesus as my personal saviour when I was 15 years old. When she first started sponsoring me I did not know the reason she supported me but today I understand that it was God’s plan. He had a plan for me even before I was born and today this gives me courage to go and share my story with the world. I tell them that I am proud that I suffered from poverty because God wanted to release me from it by using one of His own people and use me as His disciple to help kids who are suffering just like me. It is because of my sponsor that I graduated with a Bachelor in Business Administration majoring in finance and marketing. It is because of her I can be called a man of God, a disciple, a Christ follower. She sponsored me when there was no one to listen to my voice and helped me to bring myself to the kingdom of God. I know that God has something for me because He was faithful, He is faithful and He will be faithful. Vicky’s sponsor didn’t just change his life … he changed the lives of Vicky’s entire family.We, humans, are social animals and we live in the society by standing with and supporting each other. It doesn’t mean that we should support only our children. There is only one universal relationship between all and that is love. With love comes compassion., and that is the mission of this initiative, about which you can get the full report on our official website. Sponsor a child like Vicky and see what God might do through you! 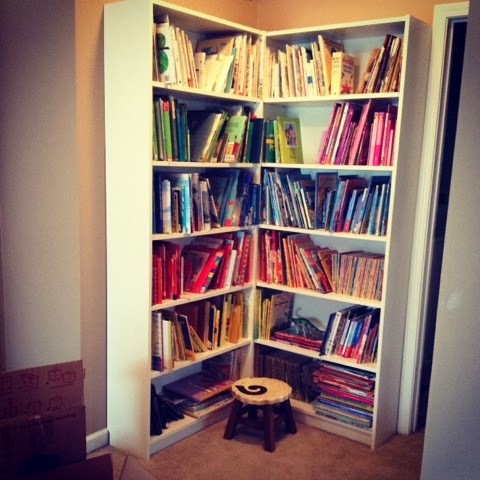 I did arrange the kids books by color and am waiting to see how that plays out in real life. You should know that this is just our fiction collection…. Will attack the nonfiction another day. I’ll not be color blocking those– I arrange them by topic! The initial pile of books was so huge that thinking about a proper system to arrange was not my priority. My main focus was on shortlisting and removing the old books and baby stuff that are no longer useful for my school-goers. Maybe, these books can become handy for some crafts work, but then I always have the option of the internet and stationary shops. So, why to fill up my cupboard now and create more things for commotion? Colour was the easiest and most noticeable feature to pick when I was doing the double task of sorting and clearing the book pile. So I arranged them on the basis of color for the first-hand cleaning. Once I was done with the clutter-clearing part, I realized that the shelf does look cleaner now, but picking a specific book from it involves some amount of hard work and time. Unless we use any book for multiple times or the book has a very distinguishable feature, it is not practical to remember the color of the book. Also, some books come in sets of different volumes which are same in color, size and cover pattern. Sometimes, only the title or the tagline change. I should find another way to organize them, may be based on the alphabetical order of the author names or the title of the book. Or there might be another way to do it like the regular libraries do. Divide the books based on their genre. Yes, they are all kids’ books, but some are science books, some fantasies, some are mysteries or picture books and activity books. 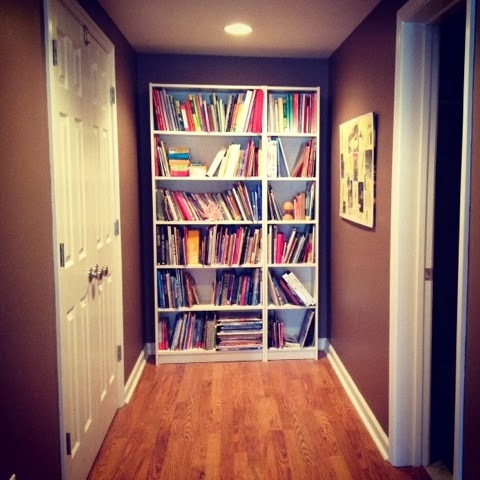 I think that can ease the task of book arranging and book selection. If I had started arranging the shelf from the time I developed the habit of buying books, like I sort articles in my laptop while downloading from this website, it would have been very easy to arrange them according to the time of their purchase. There’s a free table at the girl’s school where parents put things that they want to get rid of. 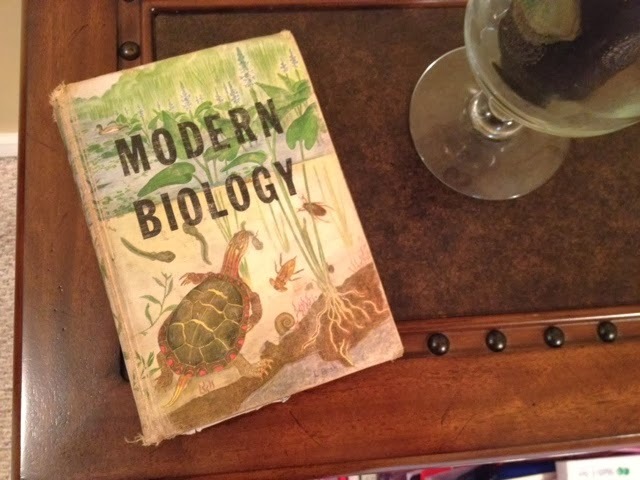 Last week, I found this gorgeous old biology book. I was mostly intrigued by the cover art–looks like a book I’d like to display front-facing somewhere in my home. However, the inside has a great transparent frog anatomy and human anatomy section which is very intriguing to Juliet. So it’s good on the inside and outside–win/win!The cover picture looks like hand-painted with a glimpse of the biological diversity of earth and gives the impression that this is for children. The content inside also tells the same, especially for the simplicity of language, an illustration of practical examples and easy to follow, but scientifically accurate and attractive diagrams. Frog and human anatomies are just some examples of the amazing content the book is holding. It was as if I found a gem, which although was meant for children but is capable of infusing biology into my rusted brain. I would recommend this book to all those elders who have left behind science or those who are struggling to clarify their school-goer’s doubtful minds. I should say, I was pretty impressed by this practical guide. The scientific facts are so updated that I think the editors and writers have this book in mind always when they come across new discoveries in biological science. There are data mentioned in the book which have been a credit to real research articles published in authentic journals with high impact factors. I found a feature particularly interesting in the book. After every chapter, there is a table of quick shots, in which amazing facts about the biological forms are given. A single reading is enough for the children to memorize it. Every chapter concludes with an exercise which also has questions based on diagrams, testing both the memory and the knowledge of the readers. Towards the final portion of the book, the publishers have included some model question papers and their keys. In my opinion, if your child is able to crack these question papers, then it means that your child is thorough with the basics in biology. Yes, I got the book accidentally on the free table, but you need not go here in search of such a table in your child’s school. I just wanted to jump in and explain my sporadic posting and long absences these past several months. First, you should know that we are all fine–just in a time of transition, so it’s made posting regularly hard for me. We put our house up for sale in the spring and finally sold it in October. However, in between selling our old house and finding a new one to live in–we have been living in a friend’s basement for the past month–it is a very nice basement, but we are sort of our of our routine and without all our books and things–we just packed a suitcase and have been living out of them for a month! It was warm when we moved and now it is cold–so that has been a challenge. But we only have one week left till we move into our new-to-us house, so we think we can hang in there without our winter coats till then! What have we been up to? Just the usual school and library trips, but I have not had a lot of time or space to hang out on the internet. With Thanksgiving, Christmas, and unpacking and organizing a new home, I”m not sure that I”ll be having much time in the next few months either, but I promise, I’ll be back at some point! Sorry for the silence–if you have any requests for types of posts you’d like to see–please let me know in the comments. I’ll have lots of time to brainstorm over the next few months and hopefully have some good library lists to share in January/February.And yeah, the good news is that I have decided to expand the horizon of the books I will be discussing. Fairytales and folktales do not make our day always. We need a breath of fresh air to keep the momentum going. Since I have just gone past two real estate deals, which involved a lot of finance, geography, home science and psychology, I am now interested to learn more about these topics. In my free strolling of the libraries, I often came across these sections and was amused at the coverage of the subjects. The books are written with all age groups in mind. Take a book for children explaining terms and facts in geography, you will be mesmerized with the high definition illustrations and simple scientific language. I have given a link below on this page and you can see some pictures of the new books if you click here. The picture is one Juliet drew today at school–it’s her and Lucia in our new home–she is ready to get her bed and books and toys back and our lives back to “normal”! Hope you all are well and that you are reading lots of great books! Comments Off on Hello! I’m still alive! I have the tendency to check out 15 books for these lessons, but I find that we never get to them all. This number (4) was just perfect. We read all of them and enjoyed them all. 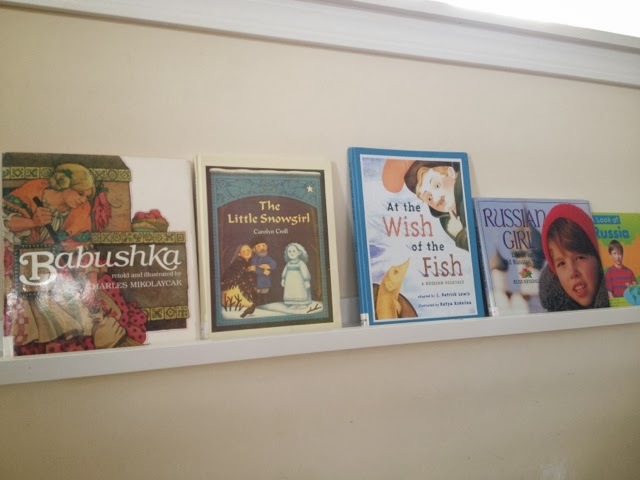 I noticed that there are so many Russian folktales out there in the children’s book world, so your library may have others that are worth reading as well.The library is so massive and you will find books wherever you look. Finding a particular book or even a book belonging to a specific genre will take ages in this way. That is why the librarian is a separate job and is a very responsible one. The books are systematically arranged into sections, with labels on the shelf specifying the genre to which that section of books belongs. For example, you will see a mystery section, a children’s book section, sci-fi, general knowledge, business etc. Even within the children’s section, further divisions can be seen in this library, like fantasies, fairy tales, picture books, poetry, folktales from around the world etc. From here, I came across the Russian folktale books, arranged in the alphabetical order. Each book seemed so interesting from their covers and content list, but I could not lend all of them. The membership limited the number of books you can take home at a time. So, I had to stringently choose among them. I imagined the favorite topics for the reading of each of the family members who will be going through these books. They may be meant for children, but we adults do not miss a chance to at least make a quick, rough reading whenever we can sneak some time. In addition to that, I had made a habit of reading any article first, before giving it to my child, so that I can ensure the appropriateness and language level of the content in it. 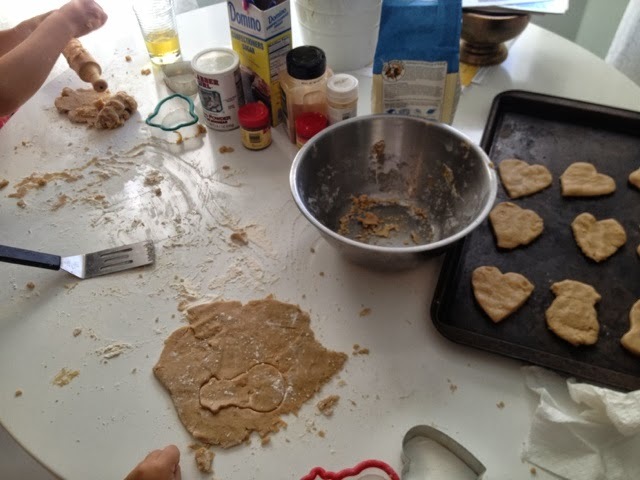 Baking is not my strength, but these were easy and fun for the kids. My Lucia is just getting a year older. It is a time to celebrate and rejoice for all of us, no element of doubt in it. However, with every upcoming birthday of Lucia, I become face-to-face with the biggest challenge to please a princess. Yes, I am the one who is always given and ideally, should be given the responsibility of bringing up new themes and ideas every year. No idea should be repeated, and no idea should be copied from the birthday parties of her friends. After all, the main aim is to make her day the most special and memorable. She should feel like a real princess amongst her friends. I should say, the most versatile and the most resourceful birthday themes come from our fairy tales, and this time our very old Cinderella came to my rescue. The dress, the crown, the royal jewelry, all are well-known like an official website content and can be arranged very easily. So, I was not really concerned about all those. Actually, these items found their place towards the end of my to-do list. There was one thing which required special attention, and that was a characteristic and most unique pair of shoes for my Lucia. An innovation struck me. I am now planning to make a game around these shoes, resembling the original fairy tale. I know my daughter’s feet size and with that, I will make her a special pair, hide the shoes among the big crowd of shoes belonging to the guests. Finding the pair among the heap will be a surprise game and also a cute gift to her. The topmost priority in the list was something else, the carriage for Cinderella. Lucia is to make a grand entry into the celebration venue in that carriage or at least imagined to be so. The shape is of course, a pumpkin, even though made of thick paperboard. And that was my plan too. I collected good quality white paperboards and sharp pencils for making the pumpkin shape. I began work on the Cinderella’s carriage for Lucia’s upcoming birthday party…. 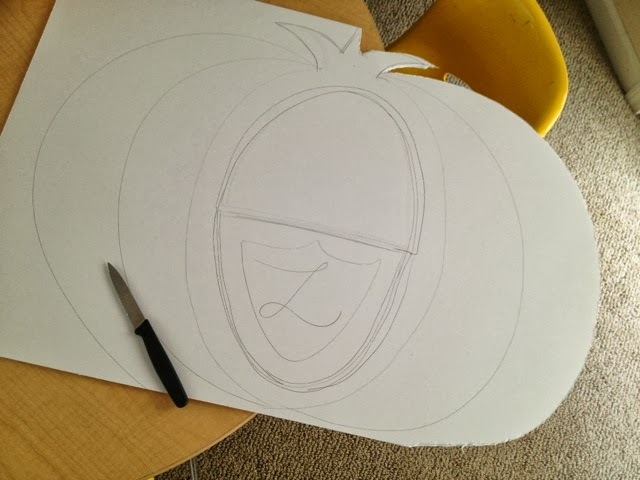 So far, I have a pumpkin shape with a window. We’ll see if I can actually get it to stay on the wagon…. Hope you are having a good week! I”ll update more on our party as we go along! Sorry for my recent absence around here–we are pretty busy these days! We are having fun planning a 3rd birthday party for Lucia. She has requested a cinderella party, so I am scouring the internet for cute ideas. The name itself creates an atmosphere of cuteness in it as we imagine our little princess in a flowing gown. We knew her favorite color and the only effort here was to take her measurements for the silk, satin and net gown. Her attires were next on the list, with the crown, chain, bracelets, anklets, and of course, the most adorable pair of shoes. She goes to the nursery now, which means we will have a huge guest list dominated by her friends. She will be hoping not only to make them happy with the celebration but also marvel at the beauty of the party including herself. Once Lucia’s Cinderella was decided, we turned towards the decoration and the hosting place. The color of the decor was decided to match with her gown and the toys included the cutest and softest we could find from the stores. The lights were of pulpy luminescence and arranged around the decor. Now came our biggest challenge! Cinderella’s wagon. It should definitely look cute, but at the same time safely and easily mobile and resemble the fairy tale wagon to the possible extent. The image in the storybook was completely imprinted in our mind, but that was not enough. We needed the techniques to keep it as original as it can. We started our exploration of that one design which combines cuteness and uniqueness, for didn’t want Lucia to get concerned about repetition. The internet and the local stored opened before us a lot of options, but each had one issue or the other as a mismatch to the picture we had in our mind. Finally, our luck hit us and we didn’t have to search for long. We got our catch like an ultimate ray of hope here. Stumbled across this cute wagon from MiniWagons on Etsy. They have a lot of beautiful wagons and carriages in this Cinderella style. We are using a vintage disney CINDERELLA book (the one I read as a kid) as our inspiration for the party because we love the colors and the kids are most familiar and fond of this version. However, there are so many amazing other illustrated versions that would be fun to use as inspiration. I think Marcia Brown’s Cinderella is also gorgeous and would be perfect for a party theme as well. What are you up to? What are you reading? It’s always fun to receive a package of review books from Owl Kids Books. Last week we received some new releases and I wanted to share them with you here. The Long, Long Line was Lucia’s favorite. She requested that we read this one over and over again. The animals are waiting in line for something REALLY fun. I won’t ruin the surprise by telling you what it is, but you are going to like it. Trust me. You know we love birds around here, and Is This Panama? : A Migration Story was a good mix of birds and other migrating animals. This was more on Juliet’s level as there was a lot of text and some good scientific information at the back of the book. Oddrey and the New Kid was another of Lucia’s favorites. It’s a fun story about Oddrey and a tall-tale-telling new kid. Have you read any of these? What do you think? Thanks again to Owl Kids Books for the review copies! All opinions expressed are my own. Some of the links will take you other reviews written by me about the books I read and the ones I selected for my kids. More than the books we read, I believe that we should be more thorough about the books we give our children for these beginning reads can lead them to have a good or a bad reading habit. Their following reading preference may be based on this initial picture created on their minds, for which we are responsible. So do not forget to read the reviews and also contribute to your comments for the discussion to become interactive. Some of the remaining links will take you to reliable ideas for making an extra source of income, simply by sitting at home and playing with a software. You do not have to be a software expert for this. Read about them with the same seriousness with which you read your favorite book and arrive at your choices to try your luck of wealth. Who know! You may strike gold with a Q Profit System in a matter of a few minutes and your reading horizon will be expanded.See disclosure policy for more details.